To the average person, a picture of the Model Y probably looks like a sedan. 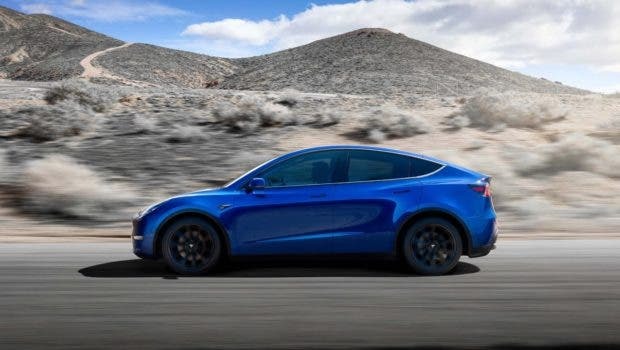 Some of the wider markets have not responded well to the Model Y because it does not look like a traditional SUV. To constructively criticize Tesla, it may have been wise to only ever call the Model Y a “crossover.” It lacks that trapezoidal shape. I have to admit that when I saw the Model Y, my heart sank. My initial gut reaction was that is not an SUV! It needs a redesigned back end! I wrote a critical article but chose not to submit it because I figured I was jumping the gun and several other CleanTechnica writers had actually been inside the Model Y. A few days later, I had indeed changed my mind completely. Dr. Mad Max Holland’s article about the Model Y’s size along with Paul Fosse’s article about the third row helped. Below is a picture from Max that shows the difference between the Model 3 and Model Y. For the past week, I have obsessively watched and read multiple reviews from people who got a test ride in the Model Y. Everyone was mesmerized by the new glass roof, which lacks a center pillar. In the Model 3, the glass roof is two pieces of glass separated by a large horizontal pillar. The general consensus is that the Model Y feels much bigger on the inside than it looks from the outside. It was specifically designed that way, Elon Musk added in a tweet. 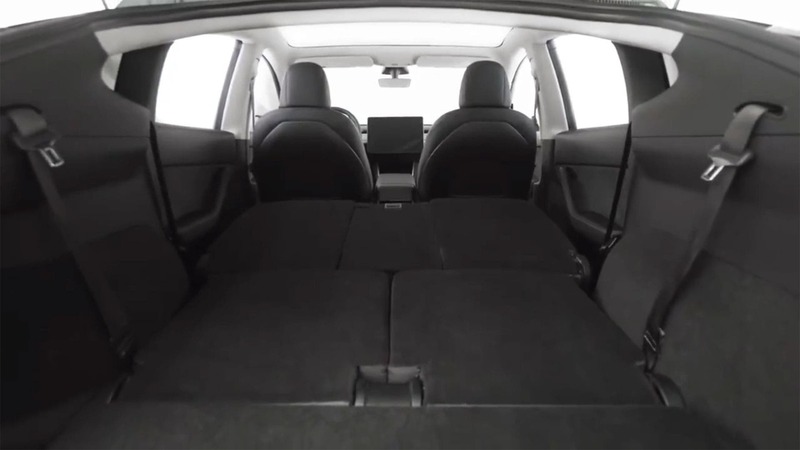 Here you can see the second- and third-row seats fold down to create 66 cubic feet of storage room. For comparison, I have a RAV4 which has 72 cubic feet. (I am planning to sell it soon as I give up owning a vehicle for transport-as-a-service). I love my RAV4 and was hoping to get an electric version, but they stopped making them after a brief trial run. I am 6’4″ and can fully lay down when the seats are folded, which allows for camping and napping on epic road trips. I expect I could do the same in the Model Y because based on unofficial reports, it may be 2 inches longer than the RAV4. 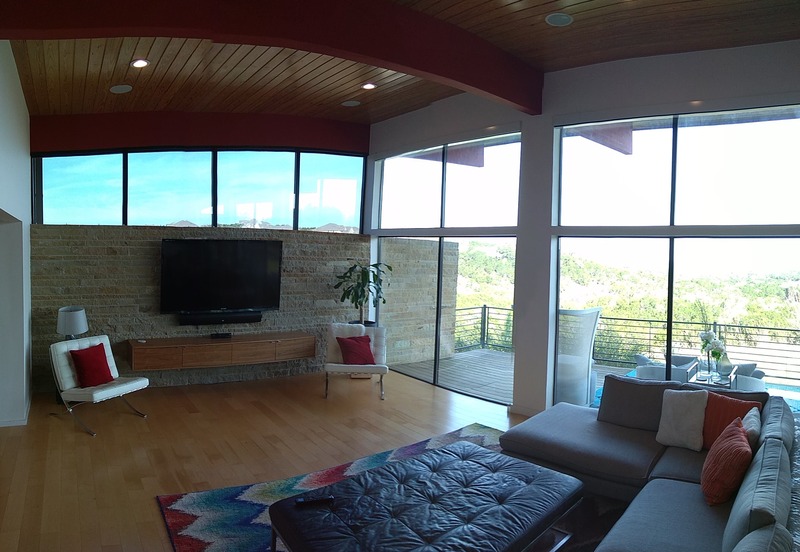 I am housesitting this week and my sister’s living room feels twice as big because the entire wall is glass. Houseguests are mesmerized by the view of this sustainable home. Watching TV is particularly enjoyable, though sometimes difficult to stay focused because your mind wonders into the clouds. Aside from trying to earn brownie points from my sister, I mention this effect because it is the same concept with the Model Y. 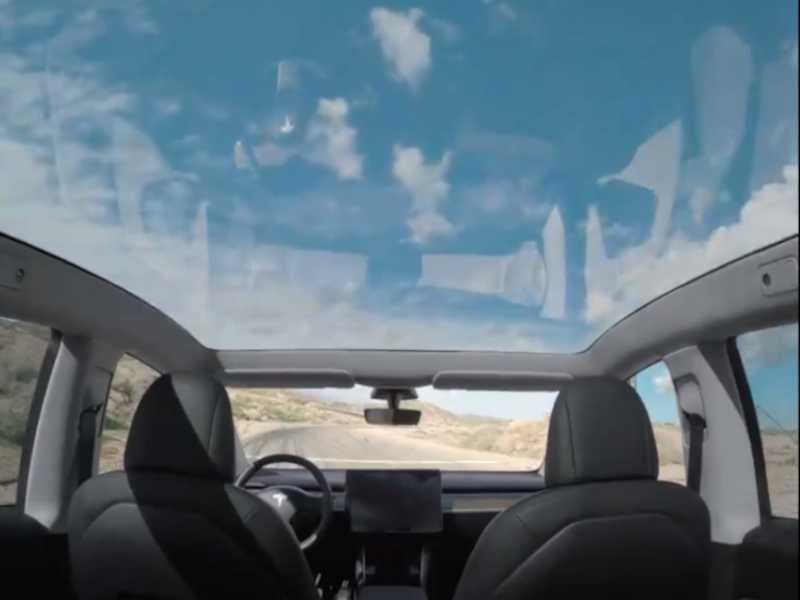 The glass roof is so unique it can make consumers forget about the trapezoidal shape they are typically used to in a crossover SUV segment. It will set a new precedent in the auto world. They have a saying that everything is bigger in Texas. Well, here in Austin, thoughtful and intelligent design can give you that feeling without having to use so many resources. To further this discussion, let’s look at another popular electric crossover SUV, the Hyundai Kona EV. 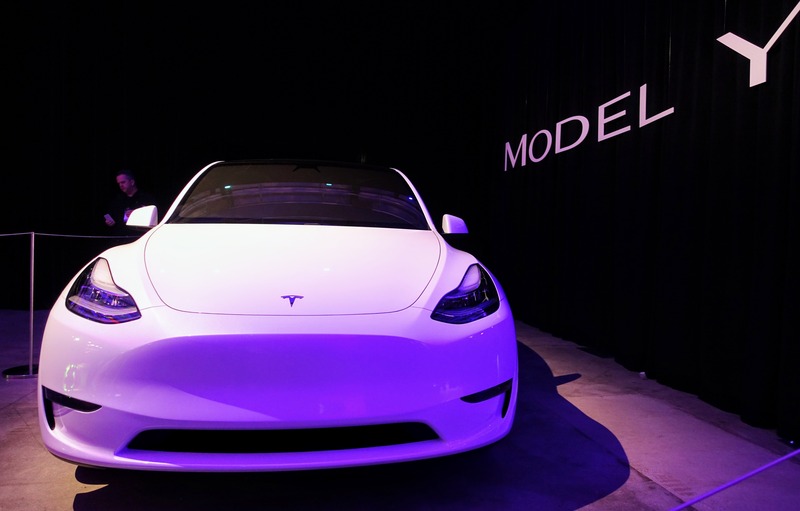 It has a coefficient drag of 0.32 — recall that the Model 3 has a coefficient drag of 0.23. The length of the Kona is 13.7 feet and the unofficial length of the Model Y is 15.4 feet. 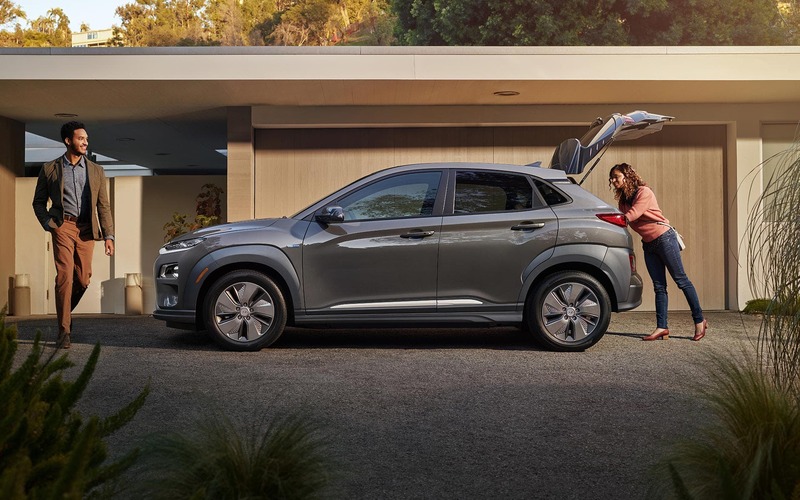 It is shocking that the Hyundai Kona EV has a tiny cargo space of 45.8 cubic feet, whereas the Tesla Model Y has 66 cubic feet of cargo space. 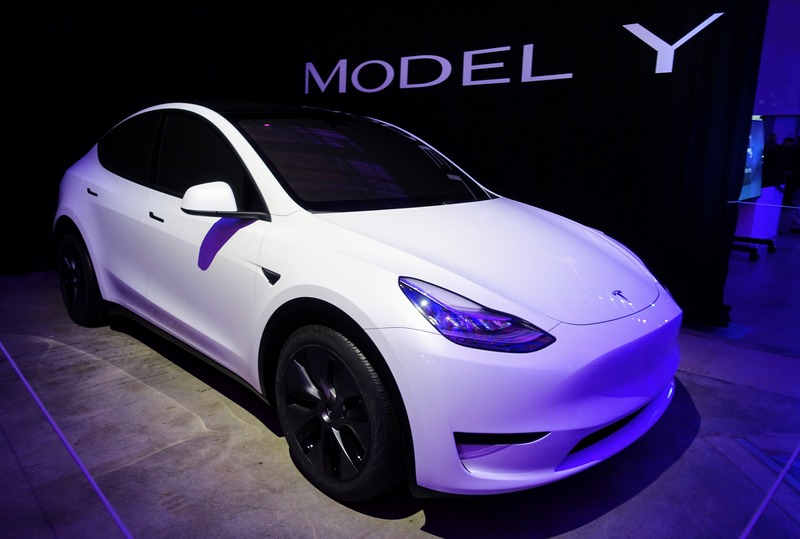 Our YouTube friends at “Like Tesla” also has a great inside Model Y video that helps to show the vehicle off a bit more — well, in the dark. (Also check out their behind-the-scenes and video of the event.) “Like Tesla” is a great YouTube channel I highly recommend. I am hoping Kim can convince my sister to get a Model Y. Then hopefully in a few years when my sister needs me to housesit, she can just send the Model Y to pick me up, since I have pretty much given up driving. 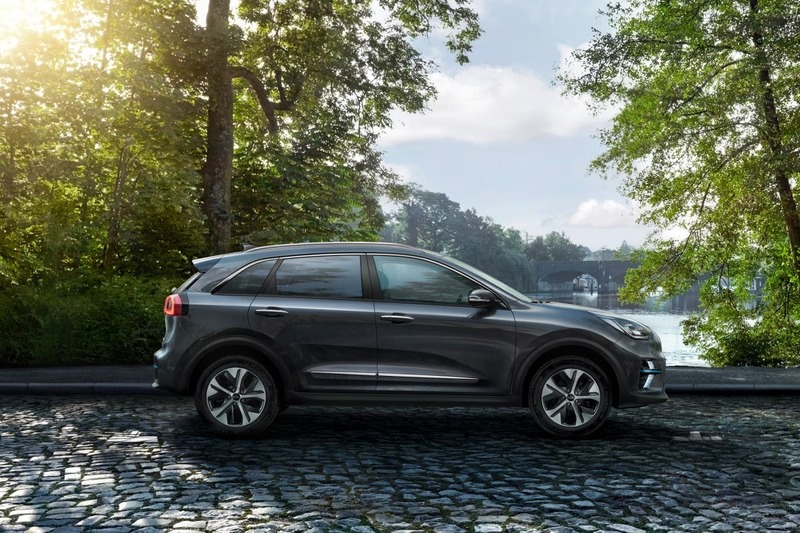 The Kia Niro (above) has a bit more of a conventional SUV look. However, that comes at a severe cost. The Niro has an inferior 0.30 drag coefficient and only 53 cubic feet of cargo space with the back seats down. Once again, the Tesla Model Y is far superior, with a drag coefficient of 0.23 and a cargo space 66 cubic feet. So, the Model Y will have 13 more cubic feet of storage, yet still be far more aerodynamic. This video gives a nice breakdown of storage capacity with the second-row seats up for the Niro EV and compares its stats to other popular EVs. 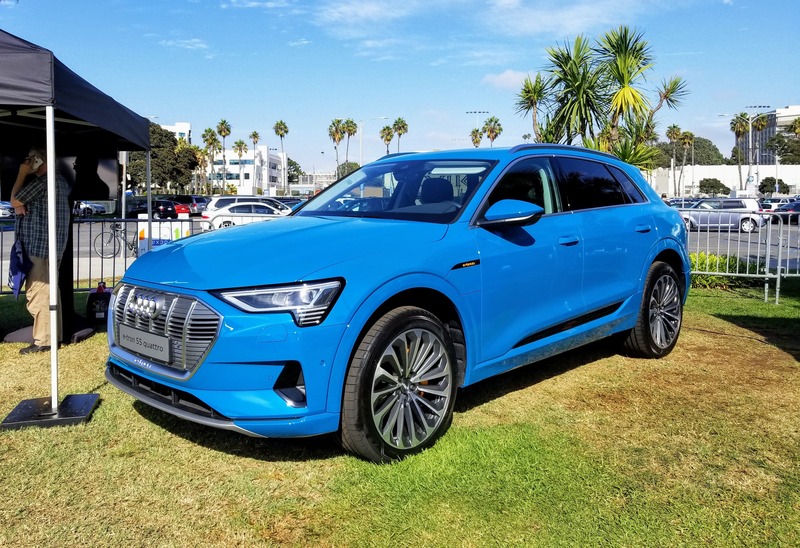 Next up, we have the Audi e-tron, with a drag coefficient of 0.28 and cargo space of only 57 cubic feet. Even at $72,000+, I cannot find an electric crossover SUV with more cargo space than a Model Y. 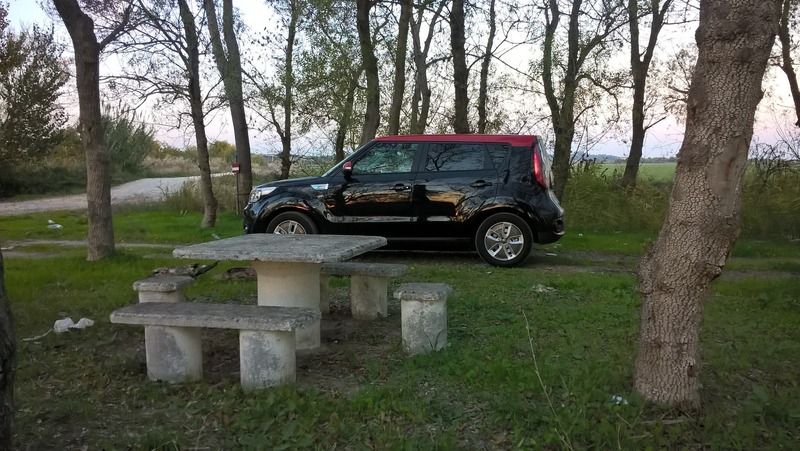 The Kia Soul EV has that traditional SUV shape, but its drag coefficient is horrendous at 0.35 and the cargo space is only 49.5 cubic feet. Additionally, it’s only 13.5 feet long. There is no laying down in the back of this car, at least for me. 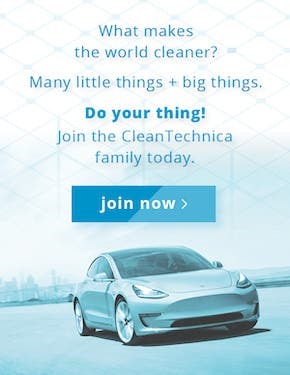 We can count on Tesla to do the right thing, instead of the easy thing. The easy thing is to make a tiny version of an SUV and keep its inefficient design because that is what people are used to. The right thing is to make a crossover that has the best combination of range, volume, safety features, autonomy, and aerodynamic shape. Tesla could have made it look like a traditional boxy SUV to match consumer taste, but that would have come at a cost. Instead, Tesla chose function and sustainability over conventional form. It is simple physics! It is design that is based upon first principles, and not what everyone else is doing. You don’t make an SUV like everyone else. Instead, you think about the most aerodynamic/safe shape and then alter that shape as little as possible to create a functional and enjoyable passenger space. Then to go above and beyond, get creative with other materials (glass) to offer even more headroom and an awesome feeling of expansiveness. Hopefully, Tesla can alter the traditional view about what the shape of SUVs should be. The shape is simply a more sustainable design. This shape can be scaled up in the future as batteries become cheaper and denser. Of course, the Model X is basically a larger version of the Model Y (with fancier doors). This shape will always make more sense in terms of physics. It is worth a shot for Tesla to create a paradigm shift in the view of what an SUV should look like. Nonetheless, I am unofficially calling for a future Model G, as in Giant, to compete with the Chevy Suburban. It will be able to fly “like a G6” (that’s a private jet). Such a vehicle will certainly be possible in the future. It could be funded from the proceeds of the Model Y. It could also be the basis for self-driving commuter shuttles. Hopefully, the Model Y’s superior shape is not going anywhere. If physics has its say, it won’t. I am sorry I cannot give you more specific details about how important the backend of the Model Y is to its drag coefficient. It was not for lack of effort. However, I know a water drop approximates the ideal shape of an aerodynamic car, and that is the likely reason for the sloping backend of the Model Y and the whole S.3.X.Y. lineup. This is something I think Tesla could have better explained in the presentation, but it is kind of obvious when looking at S.3.X.Y. models all at once. This basic shape should probably be a timeless principle just like the wheel is to transportation and the arch is to architecture. I have autonomy at #1 because it covers the other three. 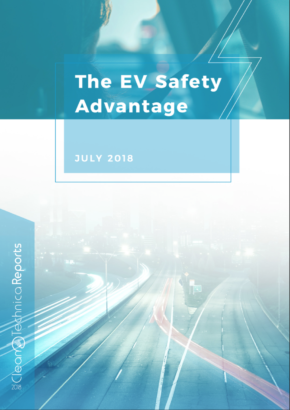 Autonomous cars will be drastically safer, more sustainable, and have the most important functionality a vehicle can have. We have to remember Tesla’s longer-term goal here, which is to develop self-driving taxis, shuttles, buses, and semi trucks. 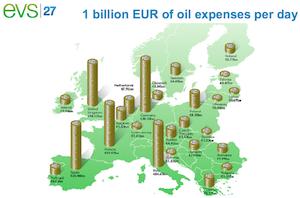 The revenue from the sales of the S.3.X.Y. models will fund a future where most people and businesses use self-driving taxis, shuttles, buses, and semi trucks (in conjunction with other forms of public transportation). Transport as a service will be significantly more sustainable, safer, and more convenient for our future cities. And it is the S.3.X.Y. lineup that will perfect self-driving technology so that most of us don’t have to own cars in the future. Eventually, we can save thousands of dollars every year by choosing to not own a car. Of course, sharing is more sustainable. I think Tesla is incredibly wise to put self-driving hardware into every Model Y. The company does not know who will purchase the self-driving software at a later date. The extra revenue from software packages will be substantial. However, over the next few years what is most important is to have as many Tesla vehicles as possible collecting data to train the self-driving software. Of all companies working on self-driving vehicles, Tesla likely has ~99% of autonomous miles driven. That lead is growing every day. Tesla could have made a slightly bigger SUV, but then it would have fewer resources to put into self-driving technology. It would likely not be able to afford to put self-driving hardware in all Model Ys. It is my belief that nearly all Model Ys will eventually be upgraded to self-driving one way or the other. Some will likely be traded in and become self-driving taxis themselves. No other car company is selling vehicles which have the opportunity to earn massive amounts of revenue after they have already been sold. 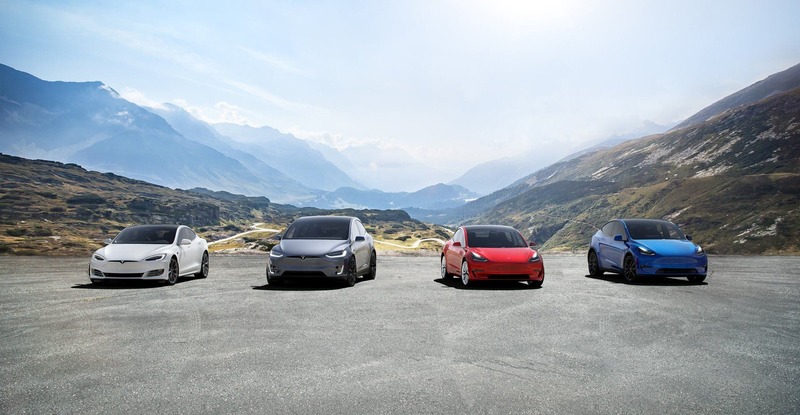 The creation of Model Y will attract the most buyers possible while achieving the four factors (goals) listed above. Hopefully, other vehicle companies will take note of the much-improved aerodynamics that the Model Y and the whole S.3.X.Y. lineup present. A drag coefficient of 0.23 or less could become the norm. 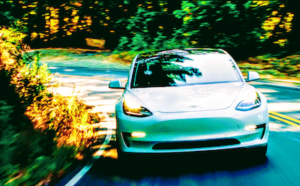 One part of Tesla’s importance is in making that norm desirable as opposed to having it required by government regulation in some form or fashion. Last week, I thought Tesla might need to change the Model Y to make it look like other SUVs. 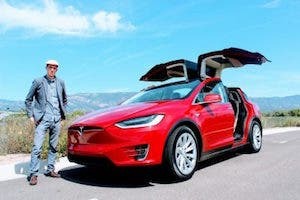 This week, I am hopeful our perception of what an SUV should look like will be permanently altered by the Tesla Model Y. Additionally, the long length of the Tesla Model Y not only makes it more spacious, aerodynamic, and efficient, but it also provides larger crumple zones to keep us safe in accidents. 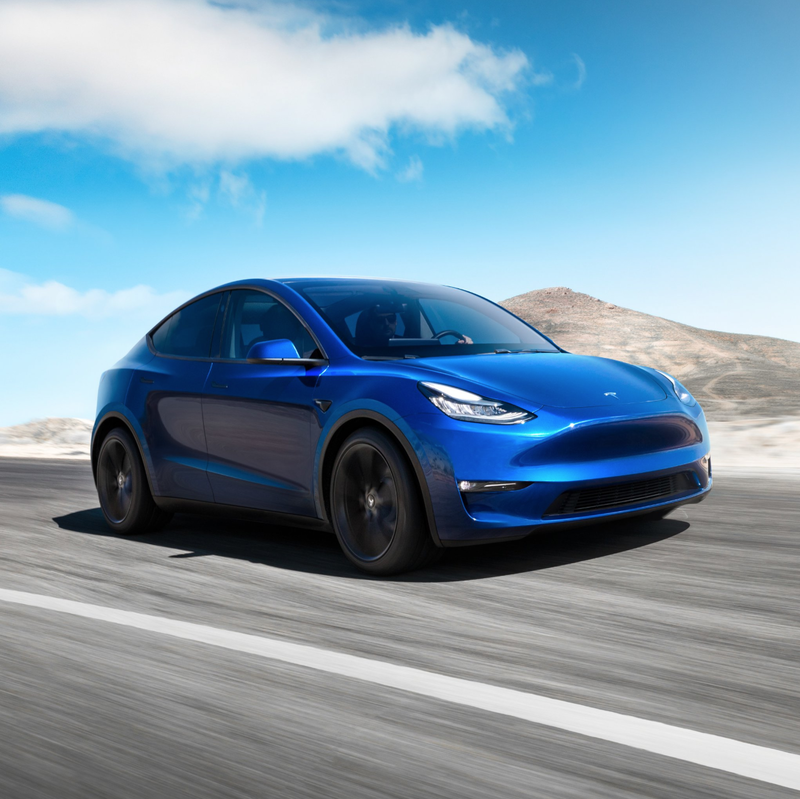 Considering what needs to be done to make transportation safe and sustainable, the Tesla Model Y is a major leap forward in technology. I think that will become more apparent over time. So stay tuned. As an addendum, I’d like to note the following: I try to read as many comments on CleanTechnica as possible. It became a full-time hobby many years ago. 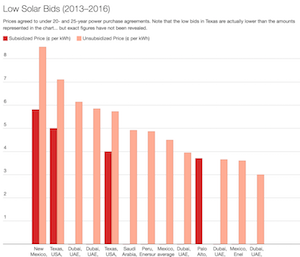 Some commentators feel we have an unfair bias towards Tesla. I would like to address that criticism. We are independent writers spread across the globe, and almost all of us have day jobs. I write about what inspires me, and what I think is most important. It was not long ago that I thought Tesla made toys for the rich. That is the opposite of the truth, as I have come to learn, which you can read about here: Why buying a Tesla is the best thing you can do for the environment. Kurt Lowder I am a jock turned wannabe geek. I fell in love with science later in life thanks to the History Channel show the “Universe.” Having taught middle school science, I strongly feel Astronomy should be taught every year because nothing excites students more than learning about the cosmos. I became an avid cleantech fan because it gives me hope about the future. My wife, my dogs, and I live simply because we love to travel the world backpacker style.